Calling all bakers! We need your help with our new Bake from Scratch column “Retro Redo.” In every issue, we’re revamping one lucky reader’s beloved heirloom recipe. Your retro baking recipes! We’re looking for the reliable, butter-stained classics you and your family have turned to year after year for delicious results. 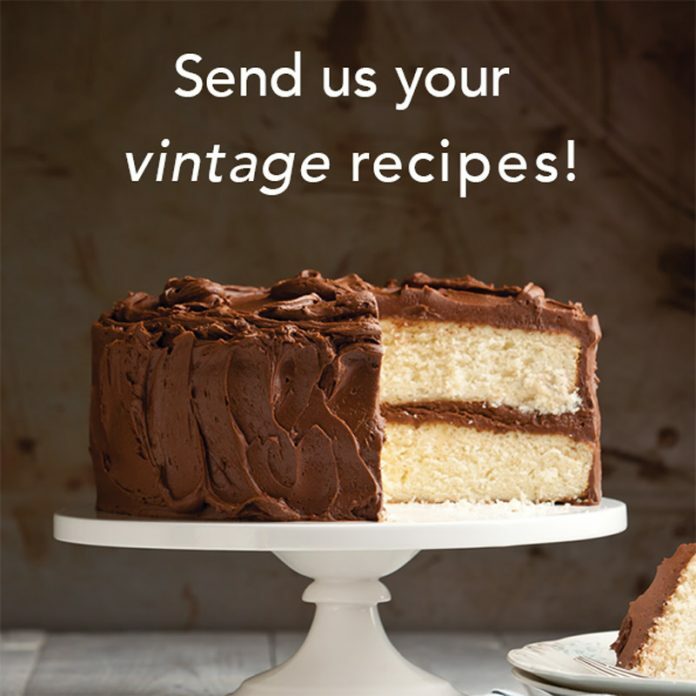 Submissions can include the following: well-worn family recipes passed down from generation to generation, Blue-Ribbon Winners, and “back of the box” favorites like Eagle Brand Sweetened Condensed Milk’s Magic Bars and Hershey’s Syrup Chocolate Cake. We want to build on the foundation of your classic to allow your favorite recipe to reach new heights. We’ll give it a tune-up, refreshing and modernizing where needed, helping these old recipes shine in a 21st-century light. If we choose your recipe, we’ll publish our updated version and your story of the original in a future issue of Bake from Scratch. Send us your recipes, preferably typed up, with accompanying photos of the dish and the well-worn original copy of the recipe. Please include the reason you cherish your recipe and why you would like to see it revamped. Email your submissions to bakefromscratch@hoffmanmedia.com with “Retro Redo” in the subject line. We know the classics can’t be beat, and we’re not going to challenge that. Instead, we think of your recipe as a beloved historic home in need of a renovation. We’ll keep its beautiful bones, but bring that vintage glory into the here and now. We can’t wait to see what you send our way and look forward to getting a glimpse of our readers’ baking traditions. Look for this column in our March/April issue, available in late February. Happy baking! A tipsy pudding. Layers of fruit, cake and custard. I’d like if there were different textures involved, because the pudding itself is wet and mushy. But it is very delicious.